When the Georgia World Congress Center (GWCC) opened its doors in 1976, the building’s first show encompassed a single exhibition hall, totaling 350,000 square feet. Today, the Congress Center officially broke ground on a game-changing expansion project, which includes a new 100,000-square-foot exhibition hall – almost three times the size of the hall that hosted that first show, the American Apparel Manufacturers Association’s Bobbin Show in October 1976. Of course the GWCC has grown by leaps and bounds in four previous major phases since America’s Bicentennial, but today’s groundbreaking – attended by Governor Nathan Deal, Georgia World Congress Center Authority officials and stakeholders – signals the first significant expansion of the country’s fourth-largest convention center in 16 years, when Building C was completed. 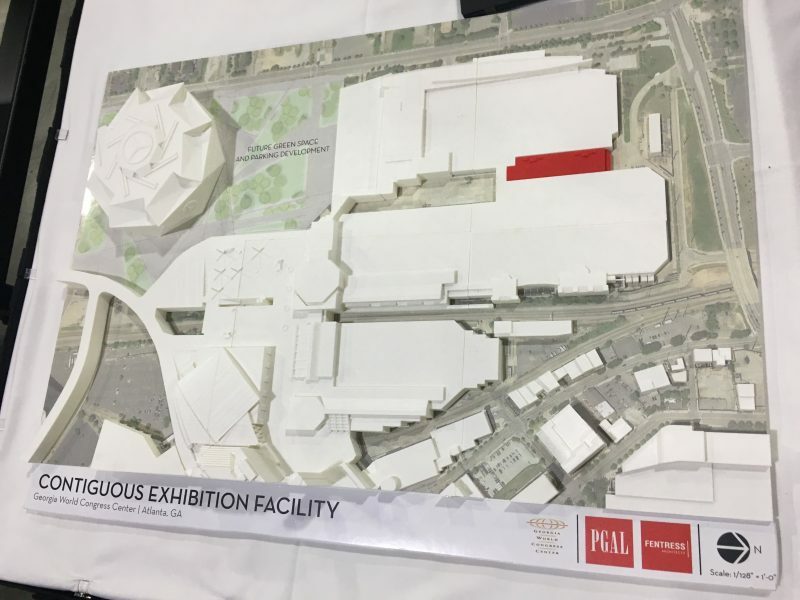 Model of the GWCC’s expansion project, with the area in red showing the new exhibit hall which will connect with existing exhibit halls in Buildings B and C to form 1 million square feet of contiguous exhibit space. Rather than acquire more land for its latest addition, the GWCC’s new $55 million expansion project is utilizing existing space in its footprint to create more meeting and exhibit space. The new exhibit hall is being built on what was loading dock areas between buildings B and C, and when completed, will connect with Halls C3, C4, B4 and B5. The result: the ability to create one massive exhibit hall featuring more than 1 million square feet of adjoining exhibit space, by rolling back the individual halls’ airwall divisions. To get a good visual feel for the project, check out this video. What that means is the GWCC will be able to vie for the industry’s largest shows that have opted for other markets because of space constraints. William Pate, President and CEO of the Atlanta Convention & Visitors Bureua, speaks at Tuesday’s GWCC expansion project groundbreaking ceremony. This means new business for the city’s hospitality and tourism industry. In fact, the potential economic impact of the GWCC’s new exhibition space is estimated at more than $600 million. Also, expanding the convention center allows some of the GWCC’s key customers, such as Atlanta-based conventions International Production & Processing Expo (IPPE), International Woodworking Fair (IWF) and Bronner Bros. International Beauty Show, to continue to grow. “I’ve walked the show floor with customers and I’ve heard some planners say they’ve turned away exhibitors due to a lack of space, so this improvement gives clients room to evolve and expand with us,” said Pate. The $55 million expansion is a key component of the organization’s 2020 Vision strategic plan that’s reshaping the GWCCA’s 220-acre downtown Atlanta campus. 2020 Vision is the Authority’s blueprint for campus growth and development, including the addition of Mercedes-Benz Stadium, demolition of the Georgia Dome, renovation of Centennial Olympic Park, and various upgrades to the GWCC. 2020 Vision projects also include redevelopment of the Georgia Dome site, where the Home Depot Back Yard is nearing completion, pre-construction work on a new multi-level parking deck has begun, and plans progress for a high-rise luxury convention hotel, which will be owned by the GWCCA. The second half of a flooring upgrade project is also full-steam-ahead at the GWCC, as new carpet is being installed in phases, to complement terrazzo that was recently added.